With the coming of Autumn and Winter, the days are shorter and it gets dark much earlier. I have attended neighborhood meetings lately and lighting is a concern. Some of you would like to have more lighting in your neighborhoods or on your street. This may be at an entrance to your neighborhood, at a street corner where children wait for a bus, or just in your own back yard. IPL does offer various options, but you do have to pay to have it installed and for the electricity. Sometimes HOA’s may want to do this out of their budget as an improvement to the neighborhood. Sometimes people may want more lighting in their back yard, especially if your back yard backs up to a field, trees, etc. I have attached information about how to go about contacting IPL if you or your HOA is interested in looking into this further. For those of you who have IPL placed streetlights in or around your neighborhood, place of employment, or when you are driving there is also information about how to report a streetlight that is not working properly. You may call those into IPL at 317-261-8111 or report it online at IPLpower.com. The streetlights do have a tag on them with a number, and if you can get that number it makes it a lot easier, but I know you cannot get those on many of our streets and roads, so give the best address you can for the location. We have all heard a lot lately about installing new street lights. Even with the amount of street lights that will be added, when you break that number down across all of Marion County it doesn’t begin to make a dent into what many folks do consider the right amount. These will be going into areas with the greatest need. If you know of a location that you feel has a need for a streetlight, please call that location into the Mayor’s Action Center at 317-327-4622 and give them the location so that it can go onto a list. There will be studies done for greatest need locations, but locations that are reported (especially if there are multiple reports) may be looked at and given better consideration as well. 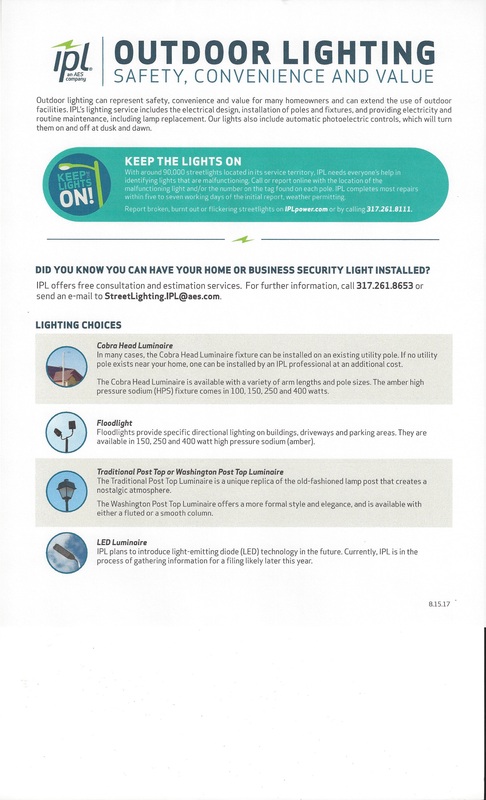 Hope this information is helpful to you – whether it is looking into lighting for your neighborhood or helping to report a streetlight that is not working.